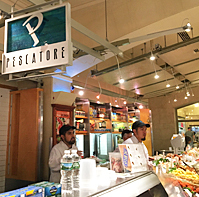 Pescatore at Grand Central is known for its ultra-fresh seafood, which is reflected in the prices, and prepared foods for people on the go. 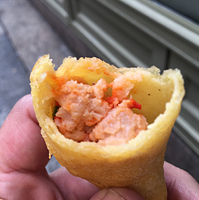 Some of those items include bite-sized lobster puffs (above) and shrimp & crab empanadas perfect for a quick bite or as appetizers for parties. The stand also sells an array of fresh seafood items, including salmon, red snapper, brooktrout and halibut which are sold by the pound, along with shrimps, scallops, lobster and much more.